The main heroine of novel/anime series Ikoku Meiro no Croisee is available for pre-order starting today. Yep, you can secure your pre-order of the adorable Nendoroid Yune at your favorite figure retailers today. She is available for 3500 Yen and scheduled for late January 2012 release. The honest young girl who always tries her very best! From the anime set in 19th century Paris, ‘Ikoku Meiro no Croisée’ comes a Nendoroid of Yune, the gentle Japanese girl who helps out in Claude’s shop. 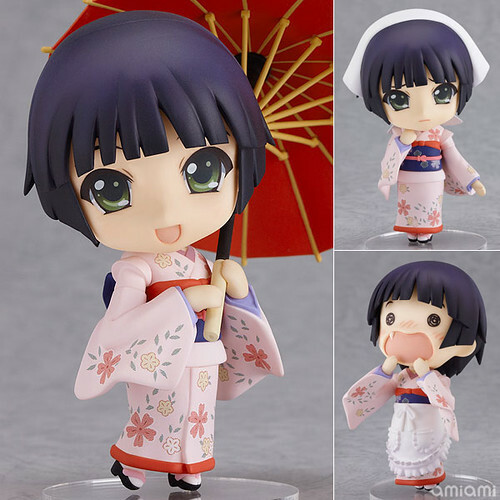 Her trademark kimono has been shrunk down to Nendoroid size, but still keeps all its delicate details. She also comes with three expressions, the picture book that Claude gave to her as a present, an umbrella, cleaning headband and apron. She even comes with an extra lower body part that allows her to be posed in the bowing position from the first episode! A huge set of optional parts to help you recreate your favorite scenes of Yune trying her very best in a foreign land! This entry was posted in News and tagged ikoku meiro no croisee, nendoroid, yune. Now make Claude GSC! Please!